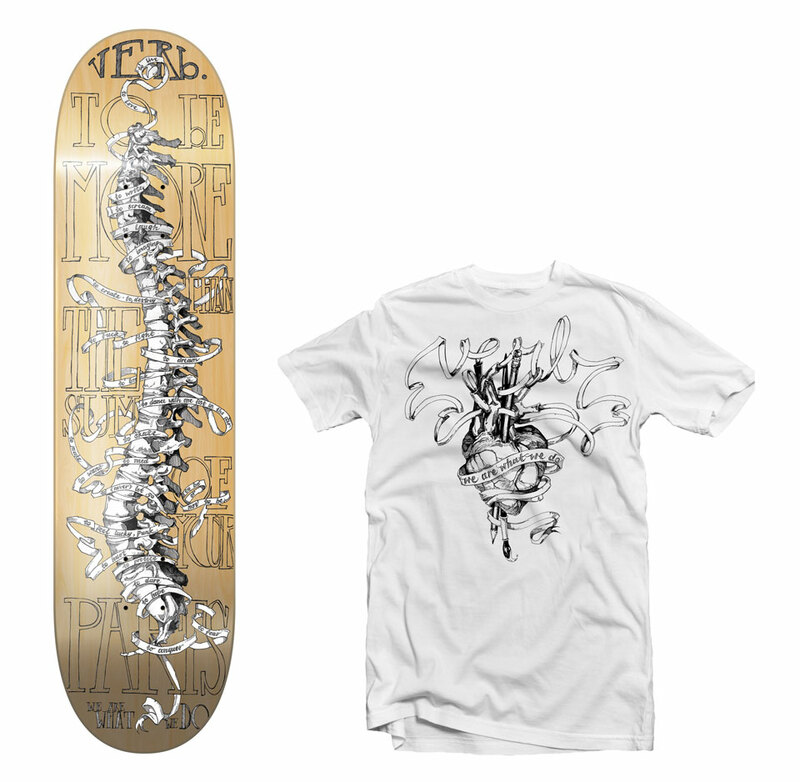 Alice Edy’s deck and t-shirt graphics for the Verb Artist Series range. In 2011 I was invited to be one of 12 artists who each designed a deck for their launch range. I worked with the idea of a verb being a “doing word”, and depicted a life-size spine wrapped in a scroll. Many different verbs are on the scroll – representing our actions that will eventually define us. We are what we do; we are more than just the sum of our parts. Alice’s Zebra and Giraffe graphic for the Verb Music Saved My Life Series range. Alice Edy is an artist, letterer and illustrator based in Cape Town, South Africa. I live in Cape Town, where I work/draw/create/consult/write on lots of varied and interesting creative projects that find me here. Mainly though, I love letters and words, and fusing traditional modes of typography with current aesthetics and content. My preference is loyally analog – I work with my hands, pens, brushes and inks as much as possible, with digitising usually being the very last step of the process. I studied Calligraphy when I was in school, and went on to study Fine Art and English Literature at University. After graduating in 2009, I worked for a branding & design agency in Johannesburg, until 2011 when I moved here, close to the ocean and have been freelancing ever since. Over the past 2 years I have created custom hand-lettering across wide variety of brands, from skateboarding to high-fashion; including logos for Revolution (skate) and Wavescape (surf), illustrated for Red Bull, as well as doing envelope calligraphy for Louis Vuitton South Africa. I laugh at myself constantly, but take what I do very seriously. When I am not in my studio I can be found reading a book and eating peanut butter, or playing on the beach with my awesome mongrel dog, Sorrow. You will know me by my dirty inky-fingers and inappropriate jokes.